Throughout the Victorian period and well into the Edwardian era, most working-class country children had little time for recreation free from the cares of school, household chores and paid employment. Because of this, such opportunities for enjoyment as did come along were eagerly seized. As soon a the chance arose youngsters would hurry outside to amuse themselves with hoops, skipping ropes, tops and marbles, or perhaps merely run wild in the fields in search of flowers, birds' nests and the tracks of animals. As Annie Jarvis (nee Seeney) of Middleton Cheney (1900-1991) recalled – "We used to have skipping ropes - stood each side of the road to turn the rope. We could play in the street, there was no traffic then. We also had hoops – wooden hoops for the girls, iron ones for the boys. We bought the hoops in Banbury but we called them 'Bowlers' (pronounce the O.W.L as in Owl). 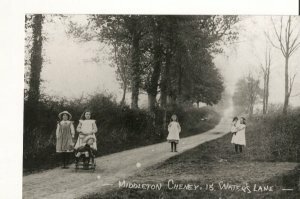 At other times games would be more formal and during the 1880s and 1890s, the girls in Middleton Cheney regularly organised dancing or rhyming games among themselves. On a summer evening, when their other chores were finished, they would gather on one of the green open spaces 'and bow and curtsey and sweep to and fro in their ankle-length frocks as they went through the same movements and sang the same rhymes as their mothers and grandmothers had done before them'. In Middleton, no doubt they had a large repertoire, including the well-known games… such as "Oranges and Lemons", "London Bridge" and "Here We Go Round the Mulberry Bush." Some games were played by forming a ring, others by taking sides, and all had distinctive rhymes, which were chanted rather than sung. But the boys found such sedate pastimes dull and restrictive. They spent their time in tree climbing, fishing and 'fox and hounds', where one of the swiftest runners in the group would act as the fox and would be chased by the rest. Again, Greville Bidwell remembers "Kids often went scrumping and we were no exception – gooseberries, apples, whatever we could find. Sometimes we'd find an old paint-tin on the dump and light a fire, we'd pinch potatoes from the allotments and cook them in our tin – delicious!" And Greville Bidwell recently remembered his summer holidays – "We only had one holiday in those days, not in and out all the time like they do now. Each summer the local boys would cross the meadows and dam the stream on Brook Field known as 'Pussum (i.e. Purston) Brook. Greville's Dad had always told him never to drink the water from a stream, '…unless it's a spring coming out of the ground' and in fact he can remember one friend who broke this rule and caught typhoid as a result. 'My friend was very, very ill but he did recover eventually. I never forgot my Dad's warning." Others preferred impromptu games of cricket and football. 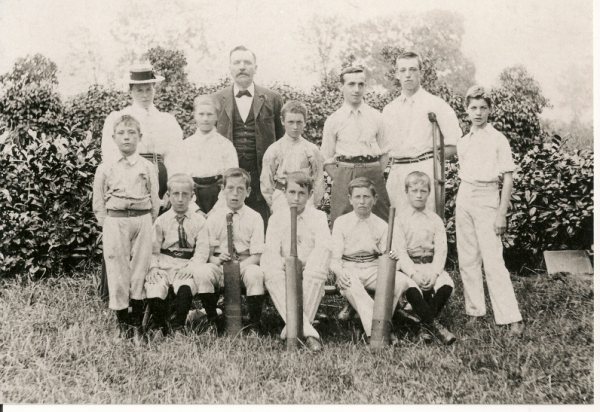 Already by the 1860s cricket was coming into prominence in Middleton where the boys would have made home-made bats and practiced their bowling along the smoother bits of road. In Len Jerrams (1910-1925) book about Middleton he refers to the local football team, known as the 'Flashlights.' "The village team continued after 1918 but unfortunately the teenage lads had difficulty in getting a game (against other villages) so they decided to form a club and team of their own. The first goal posts were felled and brought back from the Ash Beds, and when they were prepared they were erected in Flowery Dale on Mr. Winfield's Farm, where the farmhouse now stands in Waters Lane." Cricket has been enjoyed and successfully played in the village for over 100 years. 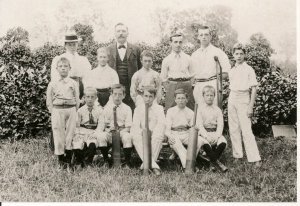 Before the turn of the century the cricket team used Mr. Blacklock's private ground for matches and Mr. Law's Home Close for practice. In 1881, according to a report in the Banbury Guardian, Middleton won against Chacombe by an innings and 40 runs. Arthur Mold (1865-1921) was born in Middleton and worked as an agricultural labourer. Arthur's cricketing talent led to him being selected to play for Lancashire and eventually to play for England, much to the delight and enthusiasm of his keen Middleton followers. were hard hitters and had no thought of pulling their punches, so the village lads got together and put them up against the blacksmith's and the butcher's sons and my two elder brothers – all strong boxers. I'm pleased to say, it was the last we saw of the town lads who proved the old adage – 'The bigger they are – the harder they fall!' 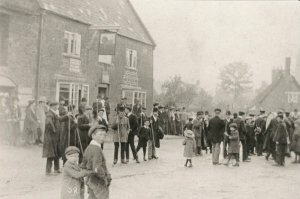 "
The Red Lion was the headquarters of the Quoits Club, the pitch being located in the Close on the opposite side of the road (now a car park). The clay beds, measuring 18 to 22 yards, were surrounded by railway sleepers on three sides with an end left open for the thrower. The quoits were round steel rings which were thrown as near as possible to a steel pin and considerable excitement was caused when a number of quoits landed near the pin, especially if one was touching. This game retained its popularity in the village right up until the outbreak of War in 1914 and although the beds were restored after 1918 it gradually died out in Middleton and sadly is no more. Bill also remembered a game in his book called Grist For the Mill (published 1992) – "If it was raining we usually resorted to a game of 'Meg.' Basically you had a huge stone with a smaller one balanced on top (i.e. Meg). The players stood about ten yards away and took it in turn to throw another stone at Meg. If you managed to knock it off you ran to pick your stone up and galloped back to your mark, however the other children would try to retrieve Meg and place it back in position before you could carry out thismanoeuvre." Another favourite pastime is mentioned by Len Jerrams in his book, A Brief History of Middleton Cheney (published 1984) – "…It was the usual custom, in an attempt to rid or destroy the very prevalent weed couchgrass, more commonly known as 'squitch,' to collect it in small heaps after ploughing and tilling, and to fire it or to cart the dried squitch out of the field and deposit it on the grass verge. The latter method was employed from this field (now the Playing Field), making it a convenient material for the erection of 'dugouts.' During the war period this was great fun, especially when the roof was put on consisting of long sticks covered with dried grass. The opening, being small, it was fairly dark inside but this was occasionally relieved by a lighted candle with no thought for danger! The hedge adjacent to this field had a number of trees in it and they made a good look-out position when the Lower Towners came in to attack this Upper Towners stronghold. These skirmishes took place in the summer evenings, finally ending with one side or the other giving chase and keeping them off 'our' territory." The late summer and autumn was, of course, the time for gathering nuts, blackberries and mushrooms, while in winter skating and sliding on frozen streams or flooded meadows were favourite pastimes, The skates would usually be home made – rough and clumsy looking, but quite good enough to provide many hours of happy exercise. One of the best places for this activity in Middleton was a field near to the Tanyard at the bottom of Glovers Lane were the deep hollows collected frozen water in an old ridge-and-furrow field and an excellent series of 'skating rinks' were formed. Hilda Ellen (Doll) Gascoigne (1904-1994) remembered the frozen winters in our village. Her mother had complained that Doll and her sister needed new shoes and her Dad eventually gave them a pair of labourer's boots each as he evidently thought they would last longer. Doll and her sister hated their new shoes and when talking about their childhood they laughingly described them - "… with a big leather tab on the back for pulling 'em on and studs in the bottom!" But when the school children were making ice-slides in the school playground the other kids would yell, "Let they Gaskins girls go first – they cuts the bacon!" There were more respectable entertainments in the winter as well – such as the Penny Readings, which were warmly welcomed by both adults and children in those days when many were still illiterate. The Reading Room in Middleton Cheney was located above the Co-op Building near the old forge in the High Street. Bill Wheeler remembered it – "A large hall was built over the Co-op and this served the purpose of a Reading Room for the village people. I only went there once or twice as I really wasn't considered old enough to attend. This was a popular venue where one could have a game of billiards or other games in relative comfort. At one end there was a stage and I have been to some very entertaining concerts given by various artists. One performer of note was Geoffrey Gilby whose brother lived at Overthorpe Hall. Geoffrey was a writer of note and a horse racing correspondent for the national press; a race is still named after him at Newbury to this day." But if the youngsters enjoyed these home-spun amusements, their pleasure was still keen when the day-to-day routine was interrupted by more dramatic events, such as the local fair, which set up in Red Lion Close (opposite the public house), a school treat or annual festival. Sunday school treats and outings were events which were relished in this fashion, and the same was true of the other major celebrations. (about forty or so). Mrs Adkins, the farmer's wife, laid on a great spread and we had races, played cricket and generally had a marvellous time." For youngsters of school age there were, first of all, those events which were celebrated by a holiday from the school itself. Custom varied from one part of the country to another, but usually Easter, May Day and Christmas were observed by a break of this kind. Years later, Len Jerrams remembered the excitement – "A big occasion was Easter as we got an egg to ourselves! I was a bit naughty here – I used to get up early and I knew where the eggs were – in a basket in our middle room, in the cupboard. Mum said, 'What are you up for?' and I replied that I'd just wanted to come down – 'I'll get the eggs out shall I?' Mum told me to be careful and, '…mind what you do!' I carried the precious eggs carefully across to the table and made sure I took the biggest one out and wrote my name on it!" For days before the great event of May Day children expended much time and effort in gathering the traditional flowers for the ceremonial garland which they would carry in their procession on 1 May or perhaps the 2nd, if May fell on a Sunday. Wallflowers, daffodils, cowslips, blue bells, violets and forget-me-nots were collected in readiness. The blooms would be fixed to the light circular wooden frame and any necessary background greenery would be provided by sweetbriar, hawthorn or other suitable bush. In the middle of the garland would be a small ledge with a May doll, which was considered essential. The doll was evidently intended to represent the Virgin Mary although the children themselves had no idea of the significance of the (Roman Catholic), tradition they were following. Once again the children in Middleton Cheney took part in these festive celebrations as these two memories demonstrate – "At Maytime we used to dress the (bowling) hoops with flowers and sit a doll in the middle – just for fun, we didn't parade them for money or anything" (Annie Jarvis nee Seeney). However, the garland was not the children's only preoccupation. First of all, they had to choose a Queen of the May from among the older – and better looking – girls. In the procession she would wear a crown of daisies or other spring flowers; accompanying her would be the King. The final touches were given to both garland and children when they assembled early in the morning of their great day. Usually the girls would be decked out in their lightest coloured dresses, while they and the boys would wear 'bright ribbon knots and bows'. Sunday best was the order of the day and many of the girls in Middleton borrowed an over-large hat from their mother and by the end of the day many of the decorated head-gear had slipped to rather a rakish angle. The procession would set off around the village and wherever a door opened, a coin was slipped into the waiting money-box and the garland duly admired before the procession wound its way to its next port of call. The May Day tradition still continues at Middleton Cheney Primary School in the form of the Midsummer Festival. They used to pick up a copper or two – sometimes they got a shilling or more. They wore nice little frocks and Mum used to help them. Nothing elaborate but they looked very nice." 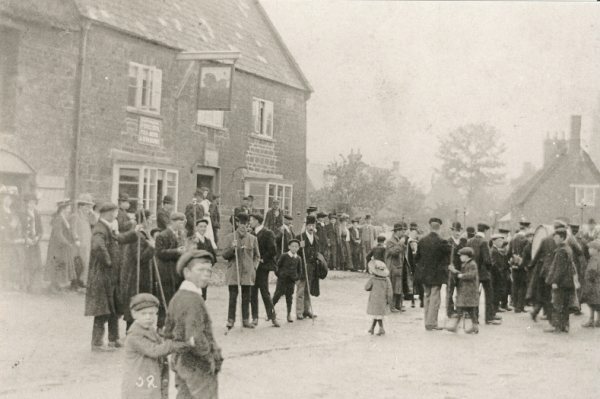 In a number of parishes traditional figures like the mummers still visited at Christmas time and these are remembered in Middleton Cheney right up until the First World War. Mummers' Plays have been performed in England, Scotland, Wales and Ireland for hundreds of years. They are folk dramas based on the legend of St. George and the Seven Champions of Christendom. They were originally mime or dumb shows (thus 'mummers' from the Middle English word mum, meaning silent.) All the characters were played by men who kept the same part for many years. Eventually, dialogue was added, but was passed on by word-of-mouth. Consequently, the 'Chinese Whispers' effect over the centuries and the loss of the real significance of the original story, makes present day performances very entertaining but virtually meaningless to most audiences. One event however, was regarded as especially important by all the village inhabitants. This was the annual feast day, which was held annually on Whit Tuesday. This was the celebration marking the successful completion of another year in the affairs of the two Friendly Societies in Middleton Cheney. It was perhaps the first instance of organised financial assistance for working men when they unfortunately became ill, or were incapacitated while following their employment. The procession was headed by men dressed in their finery and carrying staves. It usually ended up at the church where a special service was held, before the members repaired to their meeting place to do justice to a substantial dinner which awaited them. As Len Jerrams recalled, "It was at a club dinner that so many men said that it was the only time of year that they had a fresh piece of 'mate' in their mouths." Meanwhile, the rest of the village were enjoying races, dancing and all the other diversions which characterised the 'feast day.' There were stalls selling gingerbreads and humbugs; hot potatoes and gingerade. At many of the feasts there were also small simple roundabouts, which in the early days were pushed around by some of the village lads, in the chance of a free ride from time to time. 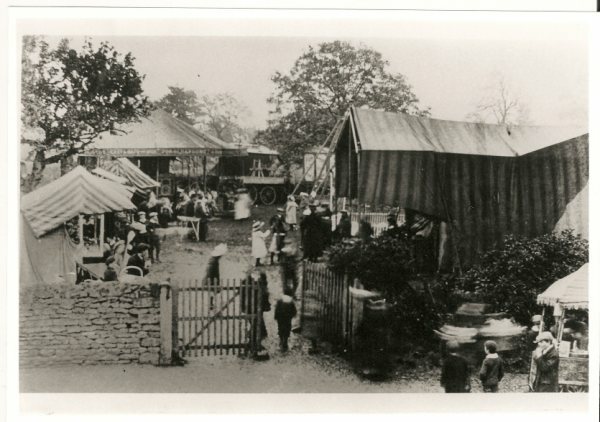 One such fair is mentioned in Len Jerrams book – "In Middleton the fair usually set up In Red Lion Close (now a car park) where Teddy Forrest's roundabouts and swings were a very prominent attraction. Most years the swings were placed on the piece of grass opposite the Baptist Church. 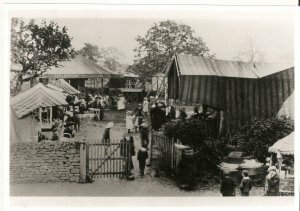 Coconut shies and other stalls were situated on the grass verge that was between the very rough road and the equally rough footpath from the Red Lion to the triangle on which the war shrine now stands." afternoon of 29 March for same reason." In addition, special celebrations of great national significance – such as the ending of the Crimean War, or the Queen's Golden and Diamond Jubilees, in the summers of 1887 and 1897, respectively, were marked by holidays and a tea for the children – plus commemorative gifts as well. Jubilee mugs and medallions were distributed in Middleton and the festivities closed late in the evening, with the lighting of a bonfire. By means of these 'extra' festivals, children could add to their basic school holiday period of about a week each Christmas and Easter or Whit, plus four or five weeks 'harvest' holiday in the summer. Such breaks probably constituted the only true 'high days and holidays' in the child's year, since, as has been seen, during many of the formal 'holiday' periods, especially during spring and summer, children were employed at home or in the fields. And despite the poverty and hardship which so often clouded their lives, country children were at least better off than their fellows in the great industrial towns when it came to the spending of their leisure hours. Instead of being confined to dirty noisy streets or confronted by the grimy bare walls surrounding many urban school playgrounds, they could enjoy the relative cleanliness and peace of their home surroundings. Even if they did have to work long hours at certain seasons of the year, they could at any rate savour to the full such diversions as came their way – be they fairs, the rare motor car, or merely the sight of a party of soldiers marching along the main road. From – The Victorian Country Child by Pamela Horn (ISBN 0862997763) published by Alan Sutton Publishing 1990.